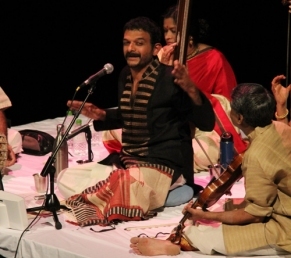 The first edition of a welcome international dance festival in Singapore aiming at covering Asian classical dances was flagged off with an interesting performance by Priyadarsini Govind, one of the leading lights of India’s Bharatanatyam performers and the enfant terrible of Carnatic music, vocalist TM Krishna from Chennai. Generally, Carnatic vocalists do not sing for a dance recital. But here are two vastly gifted dancer and musician of present generation who have boldly attempted to explore classical dance and music together, none trying to upstage each other, but work together with a deep understanding of the two forms, with mutual respect. And the artistic experience has been something which one relishes with great delight, going along with them with curiosity and its successful denouement. All this and many other concepts were offered on a silver platter by Singapore based renowned Bharatanatyam exponent Gayatri Sriram, whose Shrutilaya institute was the producer of the festival organized by Jyoti Ramesh, whose passion for dance, music and performing arts has found an ideal expression in event management. Presenting sponsor was the Bank of Singapore (BSi), in collaboration with the Jade group, and with support from various agencies, the three day festival from 14th till 16th September 2012 at The University Cultural Centre, National University of Singapore (NUS), was a runaway success. Featuring other internationally renowned dancers including Ramli Ibrahim and his Sutra Dance Company from Kuala Lumpur, the legendary Indonesian dancer Sardono Kusumo and Minneapolis based Odissi and contemporary dancer Ananya Chatterjea, Gayatri Sriram’s riveting solo of Yagyaseni from Mahabharata, a talented Kathak exponent Ponnamma Devaiah from Bangalore, young upcoming Bharatanatyam dancer Tanvi Bhaskar, disciple of Gayatri Sriram in a story revolving around Uttara from Mahabharata, and the dance drama Ramakatha, choreographed by Gayatri Sriram and Bangalore based Guru Minal Prabhu, with male professional artistes from Bangalore, and a host of young dancers from Shrutilaya, was indeed a treat for three days. The concept to give platform to young and upcoming dancers in Bharatanatyam, participation by a large cast of youngsters from Shrutilaya in a dance-drama, collaboration with other institutions like Mudrika deserve congratulations as the young generation of dancers learn a lot in terms of discipline and confidence working with senior artistes and get stage experience. Exposing them and also discerning audiences to international dancers from Asian countries is a laudable aim and deserves full support from various quarters as it builds bridges of understanding, across a vast geographical area, crossing borders and sharing diverse cultures. More than ten months of hard work to realize this dream indeed came to a fruition for which all involved deserve congratulations. The performances and presentations were of very high international festival standard and were executed with flawless precision. I was fortunate to witness the Saayujya performance by Priyadarsini Govind and TM Krishna in New Delhi two years ago. But such collaborations have also an inbuilt element of spontaneous improvisation offering novelty each time they are performed. Beginning with Swati Tirunal’s varnam “Sumasayaka” in Karnataka Kapi raga, dwelling upon the pain and anguish of a nayika in separation, suffering from the flowery arrows of Kamadeva, the delineation both in terms of sanchari bhavas and rendering the sahitya in musical terms by Priyadarsini and TM Krishna respectively, excelled in enhancing the mood embellishing the presentation. With exquisite imagination (manodharma) but restricting it to the format of the varnam for dance, TM Krishna with his soulful, melodious and mellifluous singing added an extra dimension to dance, whereas Priyadarsini, enacting abhinaya and alternating with nritta, gave an extra dimension to music through dance. As TM Krishna said while introducing the program, he sees visual for each rendering of musical notes and Bharatanatyam as Priyadarsini reiterated is visualized music, so the concept came through brilliantly. So engrossing was the presentation that at times we were immersed in rasasamadhi, a state of aesthetic bliss. The synchronization was perfect and the term Saayujya for the program was apt as the visual and the aural elements merged in a seamless manner. Bravo! Witty and charming was Krishnakarnamritam sloka, where Radha and Krishna engage in playful banter, followed by “Ra ra” javali, in which the nayika invites Lord Venkateswara and together they shall, she says, defy Kamadeva’s strategy to ‘torture’ the lovers! The most appealing was TM Krishna’s singing of “Baro Krishnayya” to which Priyadarsini displayed mother Yashoda’s love for Krishna, minus the razzle dazzle, investing it with subtle expressions and gentleness becoming the song and heartwarming singing by TM Krishna. It was in improvised tanum section by TM Krishna’s rendering, Priyadarsini responded with matching jathis, executing nritta, with gaits of elephant, deer et al and concluding in part musical section similar to tillana. They bought down the house receiving a standing ovation. The teamwork of accompanists Aadith Narayan Seshadri (nattuvangam), Vedakrishnan Venkatesan (for Priyadarsini), Manoj Siva (for TM Krishna) on mridangam, Sriramkumar Krishnamurthy on violin and lighting by Murugan Krishnan was exemplary. The perfect understanding of all artistes was praiseworthy. A touching ceremony followed with Samarpana citation honouring Prof. NS Jayalakshmi of Kalakshetra institution, Chennai. Trained in Bharatanatyam by legendary Rukmini Devi, Jaya Teacher as she is known, is an institution, with her profound practical and theoretical knowledge, sharing it generously with her innumerable disciples, universities and dance institutions nationally and internationally. She has been guiding Ph.D students for their doctoral thesis in dance. She has participated in dance dramas choreographed by Rukmini Devi and her role as Kurathi in ‘Kutrala Kuravanji’ dance drama has remained unparalleled. Training more than three generations of dancers, including Dhananjayans, Janardhanan, Balagopal, Krishnaveni, Leela Samson, Indira PP Bora, Minal Prabhu and others, Jaya Teacher was recently honoured by Sangeet Natak Akademi with Tagore Puraskar. Samarpana’s initiative to honour senior practitioners of classical dances, who have dedicated their lives to promote dance is most welcome. Jaya Teacher expressed her gratitude in her brief response. On 15th September, no wonder, all roads led to University Cultural Centre as Ramakatha saw a large crowd to encourage the youngsters. In Sanskrit there is a saying: Yavat sthasyanti Girayoh, saritascha mahitale, tavat Ramasya katha lokeshu pracharishyanti, meaning, as long as there exist mountains and rivers on the earth, till then the story of Rama shall continue to spread among the world! Students of Shrutilaya school of dance collaborated with dancers from Mudrika Ensemble. Swati Tirunal’s Sanskrit composition “Bhavayami” set to ragamalika by doyen of Carnatic music Semmangudi Srinivasan Iyer is used to unfold the story of Ramayana. Divided into six segments the well known episodes followed in quick succession, using the imaginative device of narrating story through a group of dancers like a chorus, at times the young dancers narrating the story giving them a challenge to communicate and gain experience, bringing in various emotions, including hasya, in particular during Chapa bhangam, lifting the bow by various vainglorious kings, using appropriate songs like “Thumaki chalat Ramachandra” when Rama grows up, Sita Kalyanam, Rama Kalyanam for marriage song, offering of arati, mukabhinaya, mime without using spoken words when Manthara instigates Kaikeyi to ask Dasharatha for two boons he had promised her, to banish Rama for fourteen years to forest and crown Bharata as the king, the sequence of Guha crossing the river with Rama, Lakshmana and Sita in a boat, setubandha (building of bridge), Hanuman’s flight to Lanka, Sita’s abduction, Jatayu’s fight with Ravana and the fight between Rama and Ravana, finale with Pattabhishekam, had flashes of imagination in choreographing the dance drama. It is invidious to single out any one from the young dancers for their commendable Bharatanatyam dancing and acting the roles assigned to them, as well as male dancers from Mudrika Ensemble. However, mention must be made of Surya N Rao in role of Ravana, with his commanding stage presence and personality, Ananth and Somshekhar as Rama and Lakshmana and others, for their understanding to work with younger dancers. The music by a team of versatile musicians from Bangalore, Balasubramaniam (vocals), G Gurumoorthy (mridangam), R Dayakar (violin), Vivek Krishna (flute), lighting by Ponnamma, Ananth and Iskandar Abori and nattuvangam by Minal Prabhu and Gayatri Sriram drew attention to the hard work that had gone into preparing this dance drama. I had an opportunity to see the rehearsal and was impressed by Gayatri’s strict instructions and repetition of scenes till perfection was achieved. It spoke volumes for the presentation. It is easy to fall prey to temptation of mounting an annual school show. To the credit of all concerned it transcended that pitfall and rose above as a finished dance drama production! No shortcuts were seen so that the impression one carried was of a professional performance. After the group presentation, the solo by young, beautiful Tanvi Bhaskar as Uttara, in a nonstop one hour long performance proved what an accomplished dancer she is at the age of barely seventeen. She showed confidence with excellent stamina, an ability to carry on narrative with demanding nritta and myriad expressions required in ekaharya lasyanga format. She succeeded in giving an impression that here is a young talent who shall go places. The presentation was in a Margam format, Parikshita asking mother Uttara to tell the story - Kathaya me Amba, shravanasudhamayi tam Katha (please tell me pleasant to ears like nectar, the story O mother!) - and with flashback technique the story of Uttara unfolds. After the prologue her youthfulness, expertise in arts of gita, vadya, chitra, references to virataparva, five pandavas in disguise, Arjuna as Brihannala training her in dance, Virata wanting to give her in marriage to Arjuna, who explained to the king that she is like his daughter and so should marry his son Abhimanyu, who on the twelfth day of Mahabharata war was killed in chakravyuha, Krishna saving from Brahmastra the child Uttara was bearing and so on, the enactment was engrossing. Concluding with G Gurumoorthy’s tillana, Tanvi did her gurus Gayatri Sriram and Minal Prabhu proud. The evening slot at 8pm by the celebrated national icon of Malaysia, Ramli Ibrahim and his Sutra dancers from Kuala Lumpur in Odissi titled Vision of Forever cast a spell on the onlookers. Lit up in exquisite colours and light design by Sivarajah Natarajan, Ramli, Geethika Sree, Guna and the entire ensemble from the word go electrified the stage with their powerful Tantrik theme. Guna as a devotee seeking blessings of the God was performed with vigour and energy. The iconic image of the gods and goddesses, replete with tantric philosophy and rendering of sabdaswarapata, compositions like Kavutvam in Bharatanatyam and Kavits in Kathak, a specialty of Odissi Guru Deba Prasad Das, came alive in Guna’s dancing and impersonations by female dancers. Lord Shiva’s roaming in cremation ground, adorned with garland of skulls, serpents as ornaments, Ganga river in his matted locks, expert in Tandava, Guna as a devotee beseeching Lord to protect and bless him all came like cascading waterfall in a breathless manner. One watched sitting at the edge of one’s seat! Interweaving numbers like Sthayi with ukutas, mnemonic syllables taham taham thai ta thai kit tak and with sabadswarapata words like Dandakara vamapapada, Ratisahita vamabhage, the leg extended like a staff and Rati, the consort on left side, Ramli and his group of dancers created magic in clusters, solos, groups, covering stage, entering and moving out in kaleidoscopic choreographic design. In the second half, the dancers filled the stage with the theme of Dashamahavidyas, ten manifestations of the goddesses, embodiment of the Yoginis, some like Matangi, Kamala, Dhumavati, Chhinnamasta, Bagalamukhi, some ferocious and some benign, some sticking out red tongue, spreading palms, rolling eyes, multi-armed, riding over one another, like pyramid, fearsome, dancing wildly, hypnotic and generating awe, captivated the audience. Those who came to see lyrical Odissi Pallavi and abhinaya to the ashtapadis from the Gita Govinda were ushered into this rarely seen choreographic work, a part of Shaivite and Tantric aspect of Odissi by Ramli with his superb showmanship and imaginative choreography. In Saveri Pallavi, the goddess from the forest, Sabari, adorned with serpents and fearsome in looks, enticing those entering the forest, describing her dhyanamurty, the musical image with solfa syllables according to the text, Gandhar Dhiavat, Grahasandhi, Madhyama varjita sarvada sa, re, pa, dha, sa and so on, the dance takes another dimension. Ramli in rearranged choreography shows four females surrounding Guna, lying on the floor, escaping, running, Saberi enticing, attacking with serpents, Guna, devotee, asking for her mercy, following her movements, falling prey to her gaze, other dancers realigning in circular formation, the basic stance of chauka, the bhramaris, pirouettes, tribhanga, three body bends, alsa, languorous postures, to the melodious music, works in visual wonders. Ramli’s understanding of space, exposure to ballet, contemporary dance, the use of sculptural motifs, all lend a lasting impression to his creations. He has doubtless extended the boundaries of Odissi and justifies the title Vision of Forever. That he is to receive the Sangeet Natak Akademi award for his contribution to Odissi from the President of India on 9th October 2012 at Rashtrapati Bhavan in New Delhi doubtless appears justified. Being a Muslim, he has studied Hindu philosophy deeply and it manifests in his own performance and the group choreography he creates for his extremely talented dancers. On Sunday morning was scheduled the legendary Indonesian dancer Sardono Kusumo’s performance of ‘In Breath’ along with Minneapolis based Odissi and contemporary dancer Ananya Chatterjea. Sardono and Ananya seek to move away from performance as a spectacle, as a magical, highly virtuosic event. They imagine performance as daily, as breath, as meditation. Like breath movement, they believe is incredibly fascinating, generating the life principle through criss-crossing of stillness and energy. Influences from alus/most refined style of Javanese court dance, and yogic vinyasa flow appear and dissolve in the dancers’ bodies as they move in a ‘zen’ like state, where dance happens between the place of restfulness and semi-awakening. This note was given by the dancers as an entry point to their on the spot improvisation to the specially composed music for Ananya by several musicians. But performed individually explaining what they will be searching. Sardono’s exercises in breathing, inhaling, exhaling, moving on the spot, sometimes in juxtaposition to Ananya’s various movements some inspired from Odissi, and others form Yoga, she in one direction, Sardono in another, with various movements were as per their understanding and experimentation, watched by the audience in silence. Since neither of them believes in dance as a spectacle performance, their collaboration looked completely different. After felicitating the artists, Dr. Prasenjit Duara, Director of Asian Research Institute, moderated the Q and A when Sardono explained what he was exploring. The Q and A helped the audience to understand what both were attempting in improvisation. From the highly classical Javanese court classical dance playing the role of Rama, then Hanuman and later on as Ravana, how when he visited the various islands from urban setting, he discovered various movements, freeing himself from urban set up, walking slowly, making sound so that in forest the serpents feeling the vibrations would move away or tip toeing, avoid hurting the insects or life on the ground. Breath links the various parts of the body to move in various ways. The silence and the loud scream offer different experience. Ananya referred to her work influenced by women’s movement in Kolkata when she was young and studying Odissi, watching performances on the street, processions and protests and so on. In search of movement, yogic exercises brought unexplored areas. Since the intention was not to make even the improvisation a virtuosic performance, the presentation was in total contrast to Ramli Ibrahim’s highly spectacular presentation. The audiences have to be ready for different experiences in contemporary dance. Both in terms of performance and the concept behind it, it indeed baffled the audience. 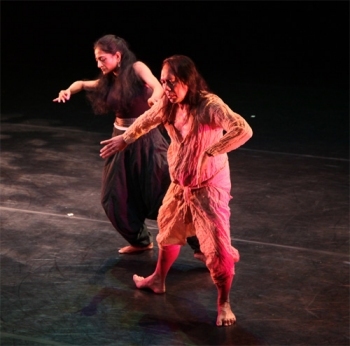 However, the comments from local dance critic Christine Kee, as follows are worth noting: "The pas de deux of Sardono Kusumo and Ananya Chatterjea was a triumph of two movement veterans, masters of different dance forms, combining to create a richly rewarding layered experience. While Chatterjea coaxed zodiac-inspired sculptural architecture from the music, Kusumo added the audible dimension of his powerful breath to his contemporary take on Javanese court dance and pencasilat, controlling the music and silent spaces with his sheer presence. Chatterjea drew on yogic vinyasa to project the feminine mystique while Indonesian traditions anchored the yang component of the unusual cross-cultural performance." In the evening, Kathak exponent Ponnamma Devaiah disciple of Guru Dr. Maya Rao from Bangalore, presented a compact one hour performance of Radha Rahas based on poems by Surdas and traditional compositions of Bindadin Maharaj, thumris, kajris, kavits, pure dance with mnemonic syllables, gat bhav, tatkar, footwork and salient features of Kathak replete with Lucknow school’s nazakat (delicacy) and kubsoorati (beauty). In the well known pada of Surdas Buzat Shyam kaun tu Gori, kahan rahat keheki chhori, asks Krishna: “Who are you, young maiden, whose daughter are you? Have never seen you here. I shall not give way to you.” Radha with equal arrogance replies about her lineage as Vrishbhankumari, daughter of Vrishbhan and asserts her right to the place where she belongs. Finally they admire each other, fall in love and dance together. Setting the mood, Ponnamma moved on to Basant ritu, Spring, playing Hori, but Radha tells her sakhis that she will only play with Krishna, Main to khelungi un sang hori Guinya, and in the end catching Krishna, dresses him up as a Gopi and shows mirror to him, making fun of him, all part of Holi! Other facet of Radha’s relationship was expressed in his dallying with other gopis and returning late to her bower, Kunj, when she seeing the telltale marks on his body, begs of him to leave her with melodious thumri of Bindadin Maharaj, nayana ratnare - eyes red, having been with other woman, even when you fall at my feet asking forgiveness, Krishna, I shall not forgive you.. With delicate and subtle expressions, mukhajabhinaya, Ponnamma succeeded in communicating her abhinaya. As a kalahantarita nayika, having quarreled with Krishna, Radha regrets and recalls happy moments of being with him. The kavits Brindaban me rachyo raas ali, the lakshana geet of Kathak describing salient features of Kathak like toda, palta, gat, hava bhav, kasak masak, urap tirup, chaal, she recalls being seated with him on the swing. Krishna has gone to Mathura and holding his flute, Radha looks into the water and sees his reflection; the concluding sloka describes the oneness of her and Krishna. Ponnamma has mastered the technique assiduously under the watchful eye of Maya Rao and internalized the feelings, expressing through angikabhinaya and facial expressions as per the dictates of Kathak tradition. She did her guru proud as one could see the very compositions like Bethi soche Braj bham nahin aye Ghanashyam ghiri ayi badari, when Radha sits on the floor looking at the clouds (Ghanashyam) gathering in the sky and is sad as Ghanashyam, meaning Krishna, has not arrived. The interpretation is rich with shabdartha, the apparent word, and vyanjana, the suggested meaning, with pun on word Ghanashyam, and was delineated with understanding making the presentation rich. The finale Yagyaseni, the one born of the sacrificial fire, solo Bharatanatyam by Gayatri Sriram was the last presentation with which the festival came to a close. Trained by Kalakshetra alumnus Guru Minal Prabhu in Kalakshetra bani, and with thorough grooming, which brought her recently the coveted Rukmini Devi Award from Krishna Gana Sabha, Gayatri has a commanding stage presence and one at once notices that here is a dancer, who, once she is on the stage, performs with élan and passion. With a svelte figure, long arms which weave geometrical patterns, straight lines, diagonals and builds up the architectonic beauty of the Bharatanatyam form, Gayatri seemed all immersed in the role of Draupadi, described by the author Pavan K Verma in his book ‘Yudhisthar and Draupadi’ as ‘Divya parimalayukta, Soundarya ati sundari, Sakalaaloka sarvottam Kanya Yagyaseni’. Doubtless there was a fire in her dancing epitomizing the character of Yagyaseni. Using the ploy of conversation between her best friend, Sakha Krishna and herself, Gayatri has explored the various facets of Draupadi’s personality, avoiding the clichés, raising questions like who was Yagyaseni? Why did fire surround her always? Who was Krishna to her? Selecting some passages from Pavan K Verma’s text for dance in a non-Margam format, Gayatri performed it with panache, unfolding various layers of Draupadi’s personality and also throwing light on her relationship with her five husbands. Opening with powerful jathis when Draupadi is born of fire, the mood was set. The text as spoken by Gauri Gupta as Draupadi and also describing the events as a narrator and as Krishna by the celebrated theatre actor Musa Fazal, the collaboration with theatre persons worked well introducing the events, flashback, and recalls. Strong willed, always alluring as Draupadi was, the question is raised: Can she be blamed for death of many Kshatriyas? Destiny is often the same as actions that are hasty! Draupadi goes back in time to where her tryst with the Kuru dynasty began. Her disillusionment after her swayamvara, being a wife of five pandavas, banishment in forest and the most engrossing depiction of Yakshaprashna, Yudhisthir’s reply to ‘who among all is best friend of the householder?’, ‘a wife is the best friend of the householder’, revealing to her Yudhisthir’s respect for her. Asking Yaksha to revive Nakul from the four brothers convinced her of the steadfast nature of Yudhisthir. Such insight into her character was well depicted. Similarly, Bhima’s boundless love for her. When she just had intoxicating fragrance of sougandhika flower, Bhima showered her with hundreds of flowers he brought from the mountain, going there, crossing through the forest, brave, always dependable, envy of every man, were fully explored by Gayatri in the ekaharya lasyanga mode, impersonating different characters. Krishna asks her about Nakul. He was vainglorious, more handsome than Kamadeva and was shocked to see Draupadi more beautiful than himself, loved her dearly even when he was known for his love for ashva, horses, and was a warrior, and she always laughed a lot in his company. Krishna asks her what about Sahadeva? Draupadi agrees with Krishna that he was an astrologer, spoke little, pondered over so many topics that baffled others, he watched the stars and their movements and alas when they were at Virat’s place, he had to tend cows. So Krishna says to her that he too was a cowherd, to which Draupadi replies that Krishna was a Yadava prince. The greatness of Sahadeva was to tell Kauravas even the muhurta of starting the war! These are interesting asides well chosen by Gayatri to project Draupadi in unusual light. The spoken text and take off in terms of abhinaya by Gayatri was commendable. Draupadi says that Krishna has always been there to protect her, as when Dussashana tried to disrobe her in court. Draupadi recalls another instance with gratitude, when Durvasa came unexpectedly during their forest banishment to be entertained with food, and only a little food was stuck to the utensil, which Krishna took and Durvasa and other rishis felt fulfilled. Krishna assures her that she will not fall, he will be there to support her, she need not look back, the war was over and soon life would start anew. On that happy note the performance ends. Gayatri’s attempt to unravel the different shades of Draupadi’s character is commendable. Draupadi fascinates every dancer. It needs lot of thinking, taking even a peg as Pavan K Verma’s text, to invest it with imagination, using the technique of Bharatanatyam, maintaining the sthayi reverting to it after various shades, is a daunting task. Gayatri undertook the challenge and has succeeded in her endeavour. As usual the teamwork of a seasoned band of Bangalore based musicians lifted the production to artistic heights. Compositions by Sudha K, Balasubramaniam Sharma and G Gurumoorthy , nattuvangam by Minal Prabhu, vocals by Balasubramaniam, mridangam by G Gurumoorthy, flute by Vivek Krishna, violin by R Dayakar, keypads by Kartyk Datar, lighting by Murgan, costumes by Supriya Komandur, text reading by Gauri Gupta and Musa Fazal, all contributed to the success of the production. The three day festival will now be a part of Singapore’s annual event and an important date on the cultural calendar. The event management by Jyoti Ramesh and her team paying attention to all details was praiseworthy. That places the festival on an international level. Along with performances, Q and A, it would add another dimension if a panel discussion is planned among the international dancers/choreographers participating in the festival and academicians, critics and scholars. The programme book is a collector’s item as it gives a wealth of information and due credit is given to each one involved. Jyoti Ramesh had also planned the display of books on dance working with Marg Publications and Sutra’s publications. Though some felt that the venue was not central, the organizers had collaborated with Asian Research Institute and thought of various state-of-art needs for performance in selecting the venue. They would do well to plan another suitable venue easy of access to audiences which will help diverse audience to participate in the festival. Dr. Sunil Kothari is a dance historian, scholar, author and a renowned dance critic. He is Vice President of World Dance Alliance Asia Pacific India chapter, based in New Delhi. He is honored by the President of India with Padma Shri, Sangeet Natak Akademi award and Senior Critic Award from Dance Critics Association, NYC. He is a regular contributor to www.narthaki.com, the roving critic for monthly magazine Sruti and is a contributing editor of Nartanam for the past 11 years.